today's China Glaze House of Colour polish is Come Rain Or Shine (press sample, kindly provided to me for review). 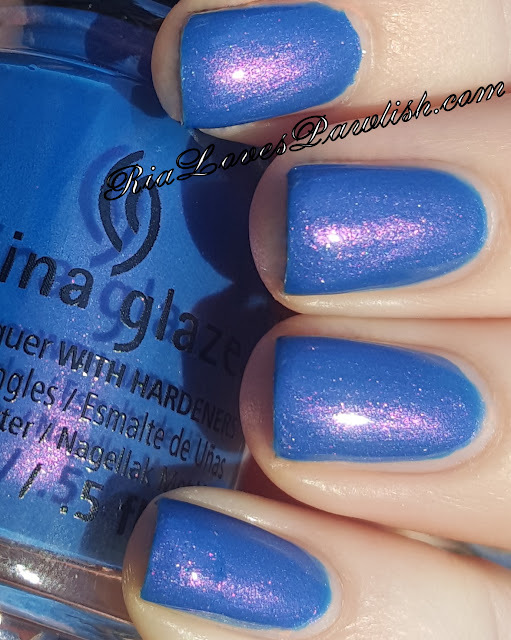 it's a royal blue shot through with with pink shimmers... basically, it's stunning! easy application and two coats brings you to full opacity... try to keep your brushstrokes even, if you get some visible ones you don't want any wobblers :) the pink shimmer is a bit shy indoors or in the shade... but it is in your face in the sunlight! i love it so much!! definitely add topcoat to bring out all this baby has to offer. two coats Come Rain Or Shine, finished off with one coat Salon Perfect Crystal Clear Top Coat. What To Watch... Global Beauty Masters on TLC! STARTS TOMORROW... Ulta's 21 Days of Beauty! !